The Matrix Sub-Ohm Tank is one of the many high quality sub-ohm options available on the market, equipped with a 5ml glass tank, 0.2 or 0.6 ohm dual vertical coils and massive adjustable airflow. 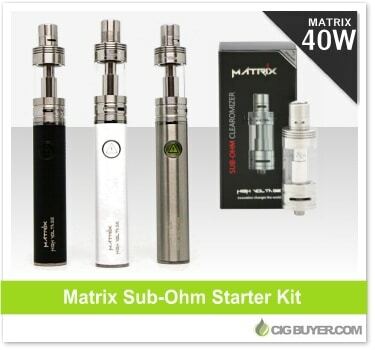 Specifically designed for the Matrix tank, High Voltage recently introduced a new Matrix Sub-Ohm Battery, offering a fixed wattage output of 40W and 2000mAh of capacity. It can handle resistances as low as 0.25 ohm, making it perfect for the Matrix and most sub-ohm tanks.